I don’t know about every other ordinary mom, but I always feel like a slacker during the Olympics. I reach for tissues when I hear stories about heroic mothers of Olympians and how they worked four jobs, stayed up all night cleaning offices and then slept in the minivan in the parking lot of the gym so their future Olympian could follow their dream. Um, I didn’t do anything remotely like that. For the record, I didn’t have a child that expressed an interest in pursuing Olympic glory but this time of year, every four years, I can’t help but wonder if that’s because I didn’t cultivate Olympic dreams. 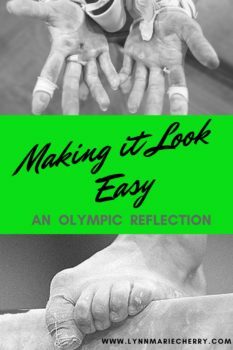 Last week after watching gymnastic competitions, I went to sleep with Tim Daggett in my head and the tumble of two competing thoughts. And these elite gymnasts do exactly that. They make hard things look easy every time they walk out on that bright green Rio floor. I have an issue with that. I think hard things should look….well…HARD. Isn’t making them look easy unfair to dreamers out there watching? When hard things look easy, we think to ourselves – I could do that – only to be shocked and dismayed when the reality of the hardness hits us like the gym floor after a botched landing. So in the spirit of accurate impressions, I feel like I owe every writer-to-be this truth: Writing a book is REALLY HARD. The journey has been long, boring, awkward and painstakingly slow. I have stared at a blank screen and believed I had nothing worth saying. When I opened up my edited document, it was bleeding with changes and comments. I’m so sick of punctuation; I don’t even feel like trying. I had a bag of Skittles and a bag of Doritos by my laptop while I waded through the sea of edits and I’m pretty sure I’ve gained a few pounds. I’ve dealt with fear, anxiety, and insomnia. And even now, when my book is finished and ready to launch, I have my doubts about it. I’m not sure it will ever be good enough. Why on earth would I want to tell you all that? Here’s why – I want you to know, when you look at the finished product, that it wasn’t easy and it took a really long time and these last few months have been brutal and I thought the struggle would never end. I think Tim and I share this desire for disclosure. He interjects “That is really hard” into his commentary because he want’s every Olympic dreamer to know the truth.